Hash browns and eggs. Oh, … Italian style. That’s right, the lowly American hash browns and eggs traditionally eaten at 3am, after of a night of bar hopping, at an all night diner, greasy spoon, or Waffle House, with a clientele as questionable as your presence there, goes gourmet with a little kitchen sleight of hand. 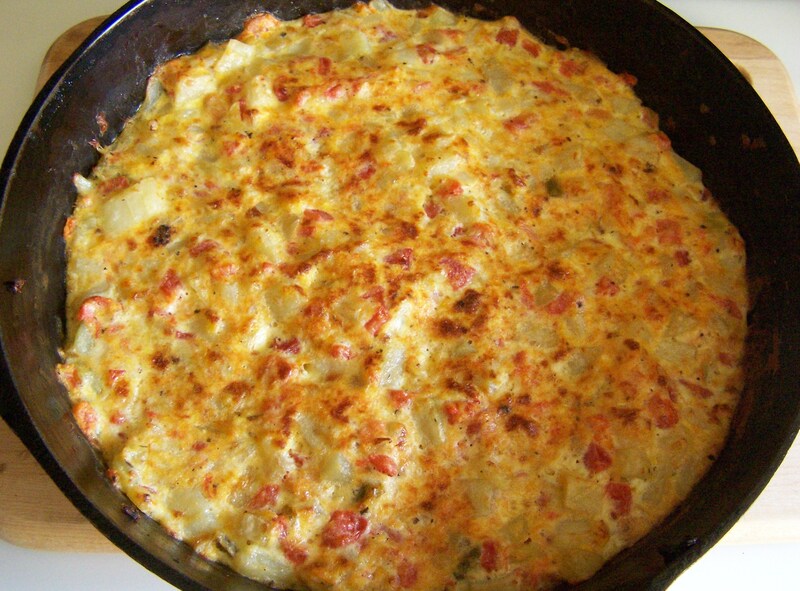 In a stove top and broiler safe skillet cook the potatoes and onions in the oil over medium heat on the stove top until the potatoes are soft (around 15 minutes). When the potatoes are cooked, stir in the, oregano, basil, garlic, salt and pepper. Immediately stir in the tomatoes and cheese. Immediately add the beaten eggs. Stir to combine. Lower the heat under the skillet slightly. Start up the broiler now. Let the bottom of the skillet mixture set on the stove top, about 4 minutes. When the bottom is set, remove the skillet from the stove and place the skillet under the broiler for about 3 to 4 minutes, until the top is set and browned nicely. Turn off the broiler. Remove the skillet. Cut into triangular pieces in the skillet. Remove the pieces as needed. What’s a frittata? Here’s what Wiki says about it. As always, the number of variations on this recipe is endless. About the only things required are; a fried “vegetable” of some sort (potato in this case), eggs and cheese. In this recipe, I used a can of diced tomatoes with green chiles for a little added kick. Diced fresh tomatoes are also in order. There are endless choices of meats and cheeses that can be added in or substituted. However, the real frittata magic, especially when someone is watching, is popping that pan under the broiler and serving those triangular pieces to your hungry family or guests. If you’re in the business, you may now charge $5 more for it. If you don’t know already, your first question is going to be, what’s a stove top and broiler safe skillet? The first thing to do is think about the little “care and use” instruction sheet that came with your cookware, which you promptly threw away 10 years ago. The next is try finding your cookware on the internet and see what the manufacturer says. After that take the general advice that an uncoated all metal skillet (metal handles too) is probably okay. Always remember that any kind of nonstick coating is not going to tolerate a broiler. Don’t use a pan with a nonstick coating under the broiler. Don’t use a pan with plastic handles under the broiler. I’m sure there are a host of other things not to put under the broiler. You’ll notice the picture below shows the centuries old designed, cast iron skillet. That’s perhaps the safest pan to use on the stove and under the broiler. Here’s a web address with some ordinary people’s advice. Also note, what’s okay for the broiler may not be okay on the stove. Take all advice for what it’s worth and remember; you break it, you bought it. You’ll also get to clean up the mess in your oven. This entry was posted on 01/04/2012 at 20:02 and is filed under Recipes, Recipes, food, cooking and related items. You can follow any responses to this entry through the RSS 2.0 feed. You can leave a response, or trackback from your own site.